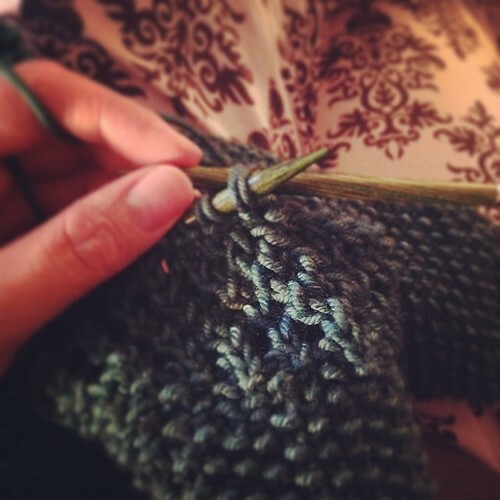 I dithered about whether or not to go to the Knitter’s Frolic. In the end we headed up in the afternoon, and it was definitely more subdued and less crowded (more parking spaces!). Of course, I don’t need any yarn, but it’s not like anyone really NEEDS yarn. I haven’t been to the Frolic in a few years and it was nice. Also really nice to run into people I know and see less often now. I did pick up a few things. 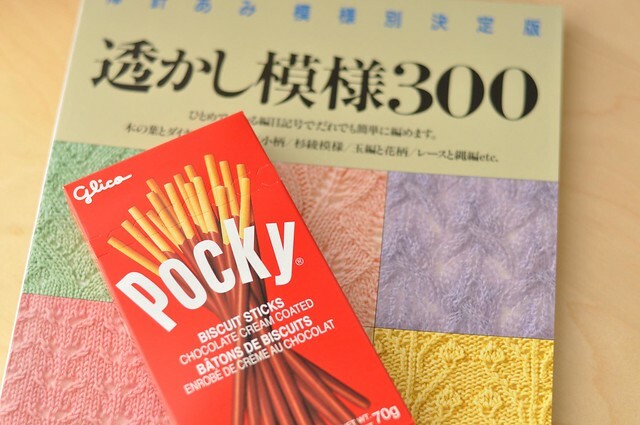 A Japanese stitch dictionary from Needle Arts Book Shop and some Pocky from the snack bar – the event is held at the Japanese Canadian Cultural Centre. Pocky isn’t hard to get around here (most of the grocery and convenience stores carry some) but, you know, it’s hard to resist. 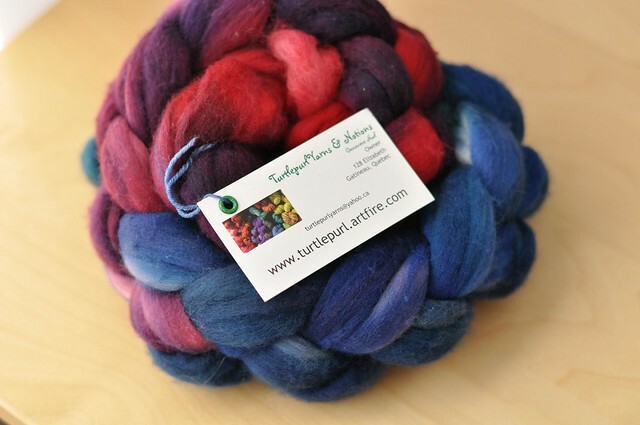 Pretty merino top from Turtlepurl. Apparently I’m in a blue period. 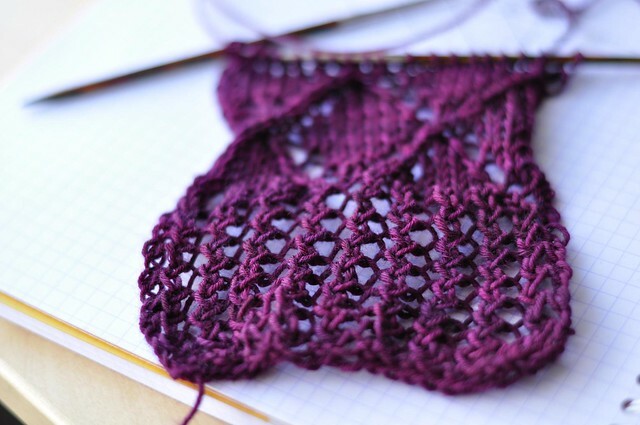 This “Cheshire Cat” yarn from Wonderland Yarns has a great hint of purple in it. 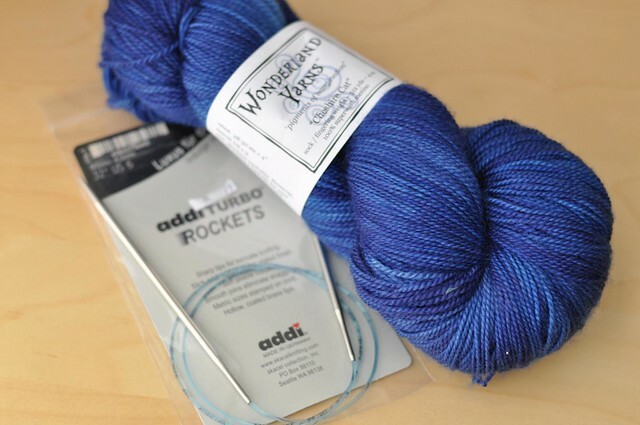 I also picked up an Addi Rockets needle to try out, despite the fact that I’m mostly avoiding metal needles in favour of wood (easier on my hands). That’s everything! Not a huge shopping trip but it was really fun. We finally got out and did some gardening on Sunday, so the peas and carrots are in. 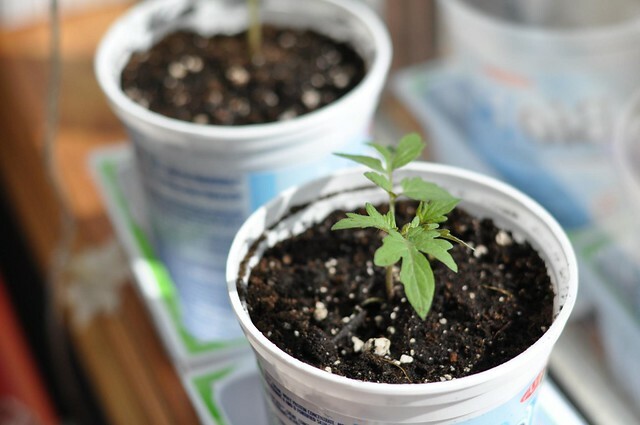 I repotted my wee seedlings into yogurt containers, which should be okay size-wise until it’s warm enough to go outside. 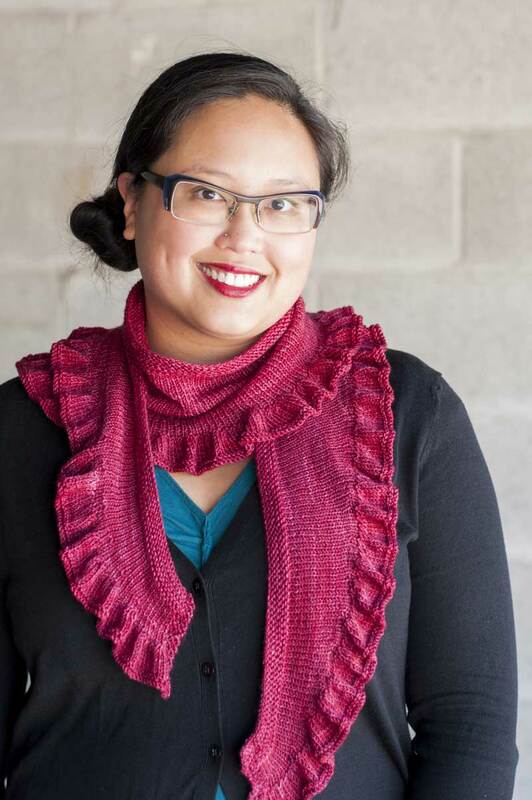 This week I worked on this scarf – it’s really simple, but I like it a lot! It’s similar to Just Enough Ruffles, so I’m hoping that those of you who liked JER will like this one too! 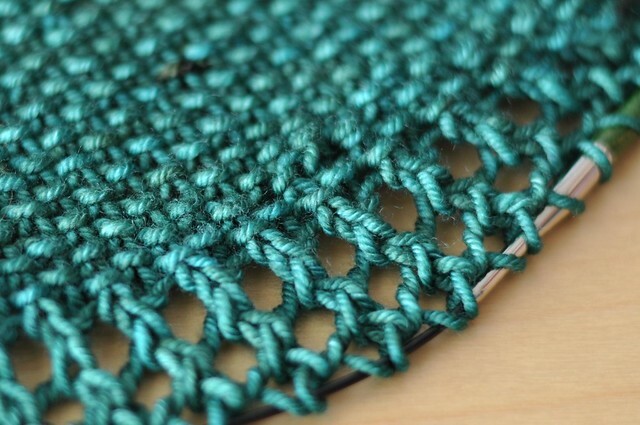 It was super quick – worsted weight and 5.5mm needles is a heck of a lot faster than anything else I’m working on at the moment. I’m hoping to get some photos this weekend and release the pattern next week! Unfortunately, not everything went so well this week. I started this sweater back in January but it hasn’t been getting any love and the pretty yarn deserves better. I ripped it out. A little bit of swatching + my first Wollmeise. My latest post at Craftsy is up: Essential Hand Spinning Supplies. If you’re headed to the Knitter’s Frolic this weekend, there’s a gift certificate for my patterns to be won at the raffle table! Note that the marketplace is Saturday only. Reading: MaddAddam by Margaret Atwood. I couldn’t really work yesterday because my arm was feeling really sore, so I cuddled up on the couch with my duvet (the bed was occupied with blocking items) and read half of it. So good. Watching: House, on Netflix. I’ve watched most of it before but I didn’t watch the last season, so I’m just working through the end. Oh House. Hey, it’s a new (and actually seasonally appropriate) pattern! 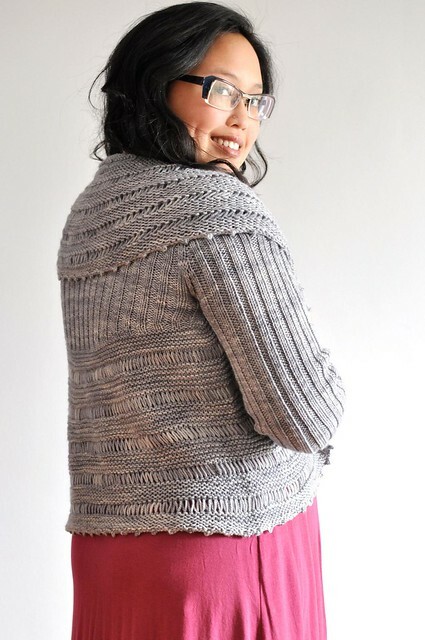 Laurentian is a swingy, springy cardigan-shrug hybrid. 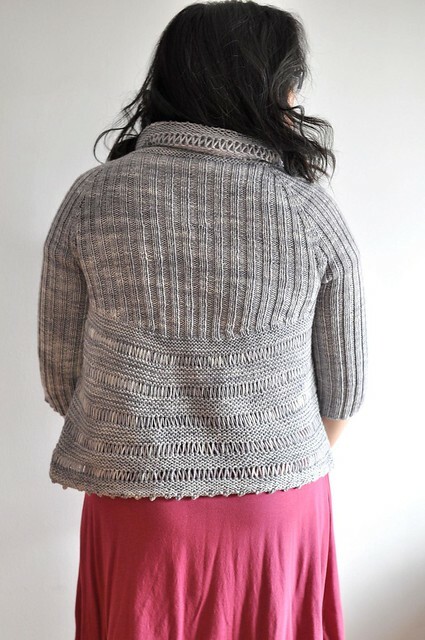 The ribbed back and shoulders are worked as a top-down, seamless raglan shrug with short rows to shape the curved back hem. 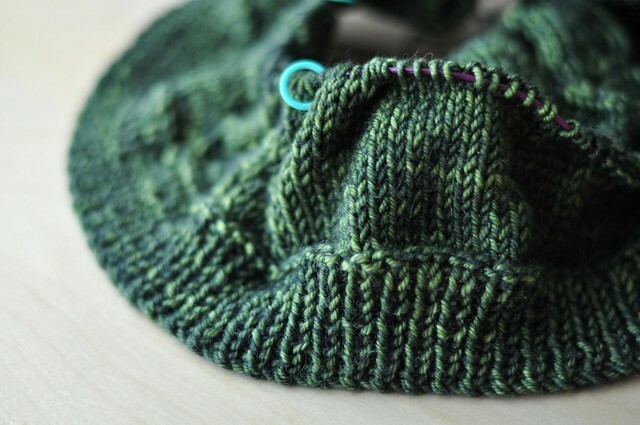 Then stitches are picked up all the way around for the garter and drop stitch pattern that forms the fronts and collar. The ribbing helps with a nice secure fit across the back and sleeves, and the drapey fronts look great open or closed. 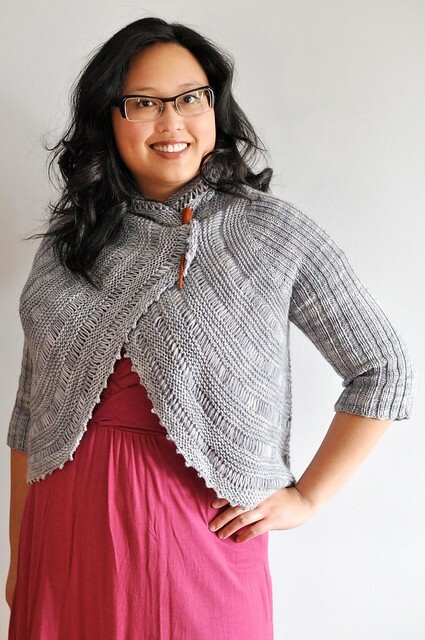 The yarn I used, Dessimo by Julie Asselin, is sadly discontinued. Here’s a list of other yarns I think would be great for this sweater – this list is by no means exhaustive, there are so many options! You’ll be looking for a yarn that has some good drape (wool or a blend with alpaca, silk, or plant fibres), and around 145 yds / 50g skein (290 yds per 100g, 330 yds per 115g). 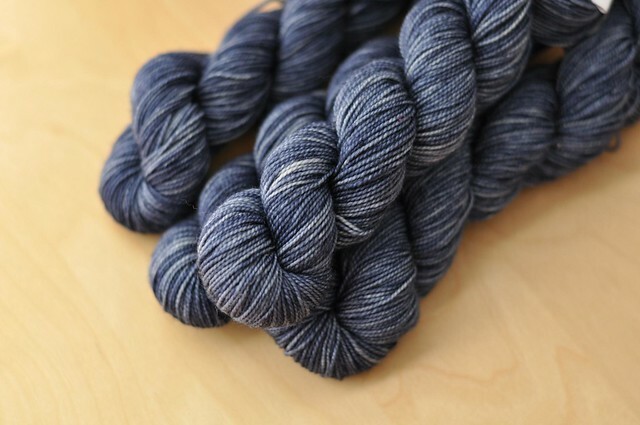 Indigodragonfly has some of this type of base as well, in the same huge 250g skeins!